Review of Home Cooked Comfort Food Cookbook Vegans Eat What? 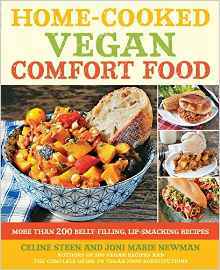 If you have ever been skeptical that plant-based/vegan fare could sufficiently satisfy those who seek old fashioned, down-home true “comfort’ food, this book will remove all doubt. The book was originally published under the title Hearty Vegan Meals for Monster Appetites and includes recipes for savory and sweet dishes that provide a lot of rib-sticking flavor and even a little nostalgia. For me, that came in the form of a Monte Cristo and Ultimate Patty Melt, two sandwiches I frequently enjoyed in my pre-veg days. Home-Cooked Vegan Comfort Food, co-authored by two talented and prolific vegan authors/chefs, includes a useful guide for meal planning and is color coded for recipes that are quick and easy, low fat, soy free and gluten free. The book is divided into chapters which include downhome breakfasts, mouthwatering mains, tantalizing sides, the breadbasket, staples and sauces and sinful sweets. Recipes tested . . . I prepared a number of recipes from the book and all quickly became family favorites including the Bacon & Egg Breakfast Sandwich, Savory Cheesecake and Irish Nachos. The delicious and versatile mushroom soup can be frozen and allows for easy ‘veganizing’ of any recipe calling for creamy condensed style soup, a great help for many cooks particularly during the holidays. My family can’t wait to try the Crispy Mac and Cheese Balls and Cake Batter Ice Cream.